Peter Barretto, President and CEO, TORLYS Inc.
TORLYS products combine attractive aesthetics with a durable, reusable and renewable design. Reducing environmental impact and offering sustainable alternatives are a key part of product development, setting TORLYS apart as a worldwide innovator and a leader in environmental initiatives. The LEED® Green Building Rating System is a design guide and rating/certification tool for new construction projects and major renovations. The Canada Green Building Council (CaGBC) is the implementing body of LEED® in Canada, having licensed and derived the original system from the U.S. Green Building Council. In the LEED rating system, points are awarded for implementing verified design principles in predefined credit descriptions. The use of TORLYS Smart Floors can directly affect the credits achieved in a LEED designed building. Installing a TORLYS Smart Floor can directly increase credits achieved* in a LEED designed building. In most cases, credits require a holistic approach to sustainable building materials and are not just flooring specific. However, TORLYS floors are a value-added component and can make a significant contribution to obtaining LEED certification. The number of points varies based on the type of flooring and the rating system used. It will also depend on whether the building is 100% new construction, or if an existing building is involved. Example: For Canadian LEED New Construction, on a project that is 100% new construction, installation of a new TORLYS Cork floor can play a part in up to 6 credits depending on the application specifics. 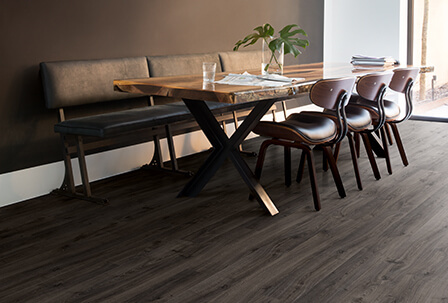 Alternatively, applying Canadian LEED New Construction for a project that involves an existing building where TORLYS Cork flooring is already in place with the intention to be reused, the product can contribute to a total of 11 credits depending on the application specifics. *Note: Simply including TORLYS flooring will not alone ensure that LEED credits are attained. No product can guarantee LEED points as the LEED system takes the entire project into account. TORLYS products can and do contribute to green building success. Design for Disassembly and Adaptability (DfD/A) (or Design for Deconstruction) is one prime example of a sustainability concept that a LEED team could adapt to try to achieve credits in the Innovation & Design Process category. To produce this document we have retained outside authorities – internationally recognized Berkeley Analytical Associates of Richmond, California and a respected Canadian LEED consultant – to ensure that information on LEED and TORLYS flooring have been independently verified. Have Questions – Need Help? TORLYS would be pleased to assist you in your next green building project. For any questions or comments about this guide or TORLYS contribution to LEED credits, please contact marketing@torlys.com.